Pirates Gold Video Slot Guide & Review - Casino Answers! Pirates Gold is a 5-reel, 9-line video slot developed by Net Entertainment, featuring two bonus games. You can play the Pirates Gold video slot at Bovada. Bets on the Pirates Gold slot machine start at $0.10 (1 coin on the first payline) and go up to $9 (10 coins on all 9 lines). Unfortunately, its system isn’t very good because you either have to keep pressing the “Single Line” button to adjust your bet or use the “Max Bet” button to play the $9 maximum bet (which is fine if that’s what you want to do). The betting range isn’t all that great on Pirates Gold, but casual players will be fine with it. To play the Pirates Gold slot game, select your bet and press the “Spin” button or else use the “Bet Max” button for the maximum bet. The highest paying symbol on the Pirates Gold online slot game is the Treasure Chest symbol. If you hit 5 Treasure Chest symbols on an active payline, you will win the 10,000 coin top jackpot on Pirates Gold. The second highest paying symbol is the Ruby Ring symbol, which will pay up to 2500X your bet per line. You can win these jackpots by playing the Pirates Gold video slot at Bovada. If you shoot down a ship with a Golden Key, you will move onto a second bonus round. You will use the arrow buttons to guide a parrot to select a chest. Click the Golden Key button to open your chest and collect your winnings. The possible prizes are 100X, 200X, 500X or 1000X your bet. Pirates Gold has an autoplay mode that can be opened up by hitting the “Auto” button. You can play 10, 25, 50, 75, 100, 250, 500, 750 or 1000 autoplay spins at a time. In the advanced settings, you can set Excalibur autoplay mode to stop on any win, if free spins is triggered, if the jackpot is won, if a single win exceeds (any amount you input) and if cash increases/decreases by (any amount you input). You can stop the autoplay mode at anytime on the Pirates Gold online slot. 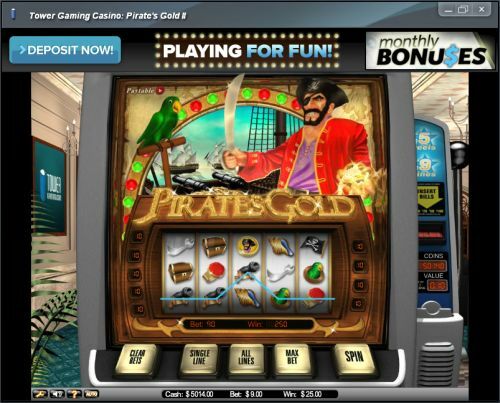 Many common video slot features such as wilds, scatters and free spins are absent on the Pirates Gold video slot. It, however, does have two bonus games and a very good top payout. The other negative is the classic slot design for a video slot, which doesn’t work very well. We would like to see this video slot re-worked into video slot format and maybe it can realize its true potential. 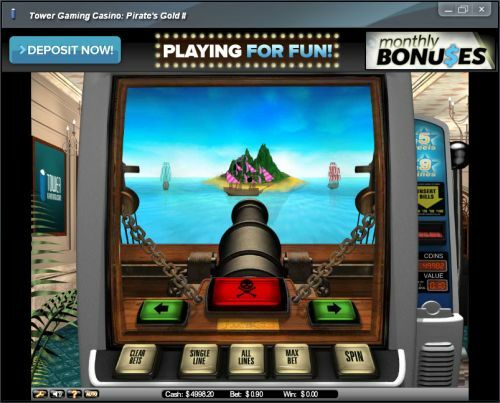 Until then, it is still a very playable and fun pirate slot for what it is. You can play the Pirates Gold video slot for real money when you sign up and make a deposit today at Bovada! Can players from the United States play the Pirates Gold video slot for real money? Unfortunately, American players are currently unable to play the Pirates Gold slot game for real money. We recommend that you read our Goldbeard Video Slot Review or go straight to playing the USA-friendly pirate video slot now at Bovada. Can I play a Flash version of the Pirates Gold video slot for free? Absolutely. Pirates Gold is available in Flash format for free or real money at Bovada. If you experience any difficulties with the Instant Play Flash casino, we suggest you make sure your version of Adobe Flash Player is up to date. Where can I read more pirate slot reviews? If you’re a-hankerin’ for some buccaneerin’, we have a full list of pirates slots available right here on Casino Answers. Please read our list of pirate slots for more.